September 8, 2005 Winnipeg, Manitoba, Canada – Last weekend I was in Los Angeles for the National UFO Conference (NUFOC) to speak about “UFO Crash Retrievals and the American Government’s Policy of Denial in the Interest of National Security.” One of my colleagues from Canada, Grant Cameron, was going to speak at the conference about the “64 Reasons Why The U. S. Government Can’t Tell the Truth About UFOs.” [See Earthfiles 12-21-04 ] Grant’s research the past few years has been physically traveling in the United States to American National Archives and Presidential libraries looking for time and date links between White House meetings and alleged UFO crash retrieval events. Grant’s work has strongly contributed to the emerging Big Picture of American presidents as far back as Franklin Delano Roosevelt having knowledge about UFO crash retrievals and cover-ups. Grant was scheduled to speak on Sunday afternoon, September 4, at the NUFOC conference, but instead there was a public announcement that his phone had been disconnected, his e-mail was not working and that no one had heard from him. Given that Grant Cameron is a well grounded man who is the building facility manager at the University of Manitoba in Winnipeg, Canada, and reporter and producer of the popular website, www.presidentialufo.com, we were all alarmed. I tried Grant’s cell phone number and only heard a rapid beeping. Finally after returning to Albuquerque from the NUFOC conference, I was able to hear Grant’s firsthand account of what appears to be American Homeland Security’s premeditated and deliberate block on Friday morning, September 2, 2005, at the Vancouver International Airport. 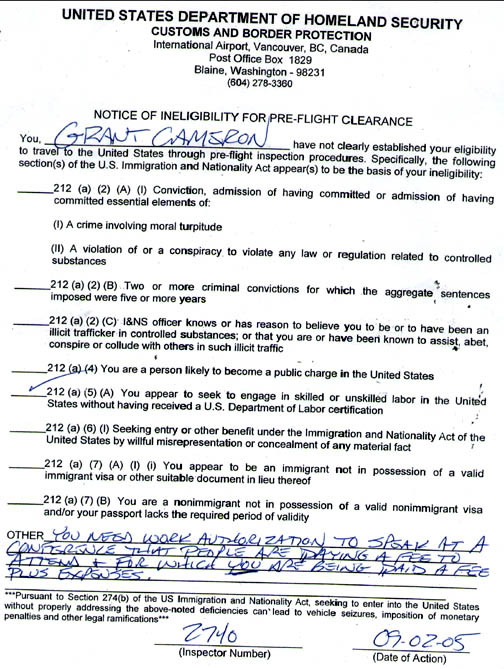 Grant Cameron was not allowed to enter the United States. He had been pulled aside by one customs checker and then sent into the offices of three U. S. Homeland Security agents. There was no courtesy from the man in front of Grant, only arrogance. I told him I had done this numerous times, had always showed appropriate paperwork. At that point, he was very arrogant about the whole thing. He didn’t say anything nice the whole time I talked to him. He then said, ‘We won’t be making that mistake again,’ referring to the fact that I had done this a number of times before and had never had any problems with going through customs to do a speech in the United States. THE IMPLICATION WAS THAT IF THEY WERE BLOCKING YOU FROM GETTING TO THE UNITED STATES FOR THE NUFOC CONFERENCE SEPTEMBER 2-4, THAT THEY WOULD BLOCK YOU ON FUTURE EFFORTS TO SPEAK AT CONFERENCES HERE. Yes, it seemed to indicate there was a new ruling in place and that whatever had happened in the past would not be happening again. United States Department of Homeland Security Customs and Border Protection Notice of Ineligibility for Pre-Flight Clearance rejecting Grant Cameron’s ability to enter the United States on September 2, 2005, to speak at the National UFO Conference held September 2-4, 2005, at the Renaissance Hollywood Hotel, Hollywood, California. Signed and dated document provided by Grant Cameron. One other strange thing happened, which was probably a coincidence is that when I got back through (to Canadian side) and I had to put my bags on the plane (back to Winnipeg), I got that through and was left with only about maybe 25 minutes before the flight. I went through security going back to get on the plane (back to Winnipeg) and got through and suddenly I’m under surveillance again. My computer came up as positive for explosives. Another officer came up and asked questions. He said, ‘I saw that they scanned your computer and it came up positive (for explosives). At that point, I figure now I’m going to jail. This is the day from hell type of thing. LIKE YOU ARE BEING REALLY SET UP? Yes, I could not believe it. It was my computer bag which I take on the plane with me. I never let it out of my sight because it has my presentation on it. As far as I knew it had never left my hands. He started asking me a lot of questions and it got closer and closer to the flight. Where did I work? Did I work with explosives? He was actually nice about the whole thing, but it was just one question after another and figured it was just a matter of time that they would arrest me. Then he asked me to run a program. I ran a program which was the presentation that I was going to give in Los Angeles. So I popped it up with the little thumbnail photos and here were George Bush and all these pictures. He says, ‘What’s he doing here? Why is Bush on there?’ He was very curious why I had all this presidential stuff on my computer. So I’m trying to explain very quickly because I’m running out of time to get on the plane and then he said, ‘OK, run another program.’ So I ran another program and I guess they realized I was not carrying a bomb. And I think what may have happened there is that I had just gotten the computer back from Dell. It had gone in for a new motherboard. I had just gotten it back that day and put it in the case to travel with. Dell might have used some sort of cleaning fluid, but it was that kind of day where one thing after another occurred. Basically I left at 7:30 a.m. in the morning and returned at 5:30 p.m. back home after flying all day and had really gone nowhere. Then I left a second message with Lisa Davis and left my cell phone asking if she needed more details, here was my situation. AND NOBODY HAD GOTTEN YOUR CELL MESSAGES APPARENTLY BY SUNDAY WHEN LISA AND THE ORGANIZERS ANNOUNCED THAT YOUR PHONE WAS DISCONNECTED, YOUR E-MAIL WAS NOT FUNCTIONING AND THEY HAD NOT HEARD FROM YOU. Timing of Customs Block Linked to History Channel Program? IT SEEMS A REASONABLE SPECULATION THAT YOUR NAME IS NOW ON A HOMELAND SECURITY LIST AS A ‘TROUBLEMAKER’ AND IT MIGHT BE LINKED DIRECTLY TO THE FACT THAT YOU HAVE BEEN DOING SERIOUS INVESTIGATION ABOUT AMERICAN PRESIDENTS AND WHAT THEY MIGHT KNOW ABOUT THE UFO PHENOMENON, THE COVER-UP. WHAT ARE YOUR OWN THOUGHTS RIGHT NOW ABOUT BEING A MARKED FIGURE ON AN ELECTRONIC LIST? Yeah, it’s kind of unnerving, I can tell you that. It did seem to have the coincidence that the History Channel had just done a special on the presidents which I had done a lot of work with them and that had appeared only about a week and a half before. It is quite ­ now you have to look forward to the fact that every time you go to the border, you really can’t agree to do anything for anybody, any presentations, because you have no idea if you are going to get across. If I am on an electronic list, it does have some benefits in that at least somebody is listening. It’s not that they are just ignoring you. If you are on a list, it means the United States is paying attention to what we are doing, which has some advantage that it gives what you say a little more impact if people know the government is listening to you. If it was to block me, the implications are that what I’m doing is significant and I’m going to have to be very sort of vigilant about fighting back and making sure my rights are maintained. I’m going to have to make sure every time I get a work permit from Homeland Security or wherever I get this from. And it’s going to be a lot of work, but it’s worth going through. You can’t just walk away and let them win. It’s a game we’ve all been in. We know what the stakes are and you can’t give up. It kind of inspires you that maybe you’re getting somewhere and you have to fight back. It’s sad, and expensive to be buying airline tickets and having to come home without going anywhere. That bothers me. But the fact that they are listening or I was purposely withheld from the United States means someone is listening to what I’m doing. And that’s a good thing. WHAT ABOUT YOUR GOING TO AN ATTORNEY IN WINNIPEG TO EXPLAIN WHAT HAPPENED AND START A GOVERNMENT-TO-GOVERNMENT, CANADA TO UNITED STATES, INQUIRY ABOUT WHY YOU WOULD HAVE BEEN REJECTED AT THE BORDER ON WHAT APPEARS TO BE A VERY FALSE AND PHONY CHARGE SINCE YOU WERE SIMPLY COMING TO SPEAK AT A CONFERENCE. 10/29/2004 — Part 1: Update On Shag Harbour, Nova Scotia, UFO Case.